Me Before You is a 2016 romantic drama film directed by Thea Sharrock in her directorial debut and adapted by English author Jojo Moyes from her 2012 novel of the same name. The film stars Emilia Clarke, Sam Claflin, Jenna Coleman, Charles Dance, Matthew Lewis, Janet McTeer, Vanessa Kirby, Joanna Lumley, and Steve Peacocke. Set in the United Kingdom, the film is shot in various historic locations around the country, including Pembroke Castle in Wales, and Chenies Manor House in Buckinghamshire, England. Released on June 3, 2016, in North America, the film received mixed reviews and grossed $208 million worldwide. William "Will" Traynor (Sam Claflin) is a successful banker and active man who is in a good relationship with his girlfriend Alicia. One morning while they are in bed, Will gets a call telling him to come into work. While walking to work, he is talking on his cell phone and inadvertently walks in front of a motorcycle. As a result of the accident, Will is paralyzed from the neck down and permanently bound to a motorized wheelchair. Alicia breaks up with him three months later, as she is tired of him pushing her away. Two years later, Louisa "Lou" Clark (Emilia Clarke) is a happy, outgoing woman who lives with and supports her working-class family. After losing her job at a local cafe, she is hired as a companion for Will Traynor. Lou has no experience, but Will's mother believes her cheery personality will help lift his spirits. Will only spends time with his nurse Nathan (Steve Peacocke), who knows that he will never regain use of his body due to the damage to his spinal cord. Nathan assists him with everything physical like movement, exercise, and clothing. Cynical and depressed because he can no longer live an active life, Will initially reacts coldly to Lou's upbeat demeanor and treats her with contempt. After two weeks, Will has a visit from his former best friend Rupert and Will's ex-girlfriend Alicia, who reveal that they are engaged. Will manages to smash all the photographs on his dresser in anger and indignation, which Lou tries to repair the next day, leading to a verbal altercation between the two. The next day, Will asks Lou to watch a film with subtitles with him, and she accepts. The two begin to bond and eventually become close friends. Lou and Will continue to talk daily; she learns that he is cultured and worldly, having traveled extensively. In contrast, her life so far has been simple, without many interests or hobbies or travel away from home. Her long-term boyfriend, Patrick (Matthew Lewis), is training to take part in a Viking triathlon in Norway, a hobby that he often chooses over spending time with her. Will urges Lou to broaden her horizons and tells her that it's her responsibility to live her life as fully as possible. While Nathan takes care of Will during one of his occasional illnesses, Lou notices Will's scarred wrists from a previous suicide attempt. Sometime after, Lou overhears an argument between Will's parents, and she learns that Will has given his parents six months before checking in to Dignitas in Switzerland for assisted suicide. Will refuses to accept life with a disability that entails dependency, pain, and suffering without any hope for recovery of his old self. Lou then takes it upon herself to change his mind. She organizes various trips and adventures to show Will that life is worth living, despite his disability. Will gradually becomes more communicative and open to her plans. Lou, Will, and Nathan attend horse racing, a trip far from perfect. Nonetheless, Lou sways Will into attending a Mozart concert. Will then decides to attend Alicia's wedding and asks Lou to accompany him. At the wedding, Lou and Will enjoy offending the strait-laced guests. Lou learns from the bride's godmother that she considers Will to be Alicia's "one that got away". Will joins Lou's family for dinner on her birthday, where they learn that Lou's father had lost his job in a leveraged buyout that happened to have been organized by a younger associate of Will. Shortly thereafter, Lou's father is offered the head of maintenance job at Stortfold Castle, which belongs to Will's family, and Lou realizes that Will is trying to help her secure her freedom from her family. Gradually they develop strong feelings for one another, which makes Patrick jealous and causes problems in Lou's seven-year long relationship, eventually leading to their break-up. During a luxurious trip to the island of Mauritius together, undertaken after another bout with pneumonia and with help from Nathan, Will informs Lou that he still intends to follow through with the euthanasia. He wants her to live a full life instead of "half a life" with him. He says their time together has been special, but he cannot bear to live in a wheelchair. He asks her to accompany him to Switzerland to be with him through his last moments. Heartbroken, she informs Will's parents upon arrival in London that she is quitting immediately and travels back to her home by bus. She does not speak to Will for the days that follow. However, at home, Lou's father convinces her to go to Will. She finds out that he has already left for Switzerland, so she decides to go to Switzerland herself to be with Will in his final moments. A few weeks after Will's death, sitting in his favorite cafe in Paris, Lou rereads the letter Will left for her. In it, he encourages her to seek out a specific perfume shop and ends off the letter with "Just live." He has left her enough money to follow her dreams. On April 2, 2014, it was announced Thea Sharrock would direct the film. On September 2, 2014, Emilia Clarke and Sam Claflin were cast in the film. Stephen Peacocke was cast on March 24, 2015, with Jenna Coleman and Charles Dance cast on April 2, 2015. On April 9, 2015, Janet McTeer joined the cast; and Brendan Coyle, Matthew Lewis, Samantha Spiro, Vanessa Kirby, and Ben Lloyd-Hughes joined the cast the next day. Principal photography began in April 2015, and ended on June 26, 2015. The film was shot in various locations in the UK, including Pembroke, Wales, and Chenies Manor House, Chenies, Buckinghamshire, England for the wedding scenes, while Mallorca, Spain, stands in for Mauritius. In July 2014, it was announced that the film would be released on August 21, 2015. In May 2015, the film's release date was moved to June 3, 2016. In November 2015, the film's release date was moved back, to March 4, 2016, before being delayed again in January 2016, to its previous June 3, 2016 release date. Me Before You grossed $56.2 million in North America and over $152 million in other territories for a total of $208.3 million, against a budget of $20 million. In North America, Me Before You opened on June 3, 2016 alongside Popstar: Never Stop Never Stopping and Teenage Mutant Ninja Turtles: Out of the Shadows and was expected to gross around $15 million from 2,704 theaters in its opening weekend. The film grossed $1.4 million from its Thursday night previews and $7.8 million on its first day. In its opening weekend the film grossed $18.3 million, finishing third at the box office behind Teenage Mutant Ninja Turtles: Out of the Shadows ($35.3 million) and X-Men: Apocalypse ($22.3 million). On Rotten Tomatoes, the film has a rating of 58% based on 151 reviews; the average rating is 5.5/10. The site's critical consensus reads, "Me Before You benefits from Emilia Clarke and Sam Claflin's alluring chemistry, although it isn't enough to compensate for its clumsy treatment of a sensitive subject." On Metacritic the film has a score of 51 out of 100 based on 36 critics, indicating "mixed or average reviews". Audiences polled by CinemaScore gave the film an average grade of "A" on an A+ to F scale. The film has suffered a backlash from many people in the disability rights movement due to what they perceive as an underlying message that people with disabilities are a burden on their families and carers, and claim the film promotes the view that people are better off dead than disabled. They view the film as advocating suicide so that their loved ones can "live boldly". The #MeBeforeEuthanasia backlash has been led by celebrities with disabilities such as Liz Carr, Penny Pepper, Mik Scarlet and Cherylee Houston and Not Dead Yet UK in the UK, and Dominick Evans, Emily Ladau and activists from Not Dead Yet in the US. Protests in the US occurred in Los Angeles, New York City, Boston, various locations in Colorado and Texas, Atlanta, Baltimore, Connecticut, Rochester, San Francisco, and multiple locations around the country. The film was also protested in Australia. 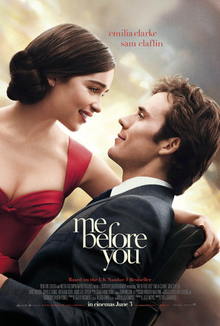 ^ "ME BEFORE YOU (12A)". British Board of Film Classification. April 21, 2016. Retrieved April 21, 2016. ^ a b Gant, Charles (May 24, 2016). "'Me Before You': Review". Screen Daily. Retrieved June 4, 2016. ^ Riley, Jenelle. "'Me Before You' Aims to Take on Hollywood's Superhero-Heavy Slate". Variety. Retrieved May 26, 2016. ^ a b c "Me Before You (2016)". Box Office Mojo. Retrieved December 18, 2016. ^ a b "Me Before You reviews". Metacritic. Retrieved June 8, 2016. ^ a b c Fleming, Mike (September 2, 2014). "'GOT's Emilia Clarke, 'Hunger Games' Sam Claflin To Star In MGM's 'Me Before You'". Deadline Hollywood. Retrieved July 24, 2015. ^ a b c Fleming, Mike (April 2, 2015). "'Doctor Who's Jenna Coleman, 'Game Of Thrones' Charles Dance Join 'Me Before You'". Deadline Hollywood. Retrieved July 24, 2015. ^ a b Ford, Rebecca (April 9, 2015). "Janet McTeer Joins MGM's 'Me Before You' (Exclusive)". Hollywood Reporter. Retrieved July 24, 2015. ^ a b c d e f Ford, Rebecca. "MGM's 'Me Before You' Rounds Out Cast (Exclusive)". Hollywood Reporter. Retrieved July 24, 2015. ^ Sarah Doran (March 29, 2016). "First look at Matthew Lewis and Joanna Lumley in new Me Before You trailer". Radio Times.com. ^ Fleming, Mike (April 2, 2014). "Thea Sharrock To Direct 'Me Before You' Movie For MGM". Deadline Hollywood. Retrieved July 24, 2015. ^ Justin Kroll (March 24, 2015). "'Me Before You': Stephen Peacocke Joins MGM Movie". Variety. Retrieved July 24, 2015. ^ Jocelyn McClurg (February 26, 2015). "Moyes writes sequel to 'Me Before You'". Usatoday.com. Retrieved July 24, 2015. ^ "On the Set for 6/29/15: Justin Lin Rolls Cameras on 'Star Trek Beyond', Emilia Clarke Wraps 'Me Before You'". Ssninsider.com. Archived from the original on June 30, 2015. Retrieved July 24, 2015. ^ Thorpe, Vanessa (May 22, 2016). "Me Before You: not just a tearjerker". The Observer. Guardian Media Group. Retrieved July 3, 2016. ^ "WB Dates 'Me Before You' For August 2015". Deadline Hollywood. July 16, 2014. Retrieved July 24, 2015. ^ Busch, Anita (May 14, 2015). "'Me Before You' Gets Release Date From Warner Bros". Deadline Hollywood. Retrieved July 24, 2015. ^ Anthony D'Alessandro. "Emilia Clare 'Me Before You' Drama Opening In March 2016". Deadline Hollywood. Retrieved November 14, 2015. ^ Anthony D'Alessandro (January 15, 2016). "Emilia Clare 'Me Before You' Drama Opening In March 2016". Deadline Hollywood. Retrieved April 17, 2016. ^ "'Teenage Mutant Ninja Turtles' Sequel to Top Box Office, But Faces Troubled Waters Ahead". TheWrap.com. ^ Anthony D'Alessandro (June 3, 2016). "'Teenage Mutant Ninja Turtles 2', 'Me Before You' Get Thursday Night Going – Box Office". Deadline Hollywood. Retrieved June 3, 2016. ^ Anthony D'Alessandro (June 5, 2016). "'Ninja Turtles 2' Muscles Up On Saturday For OK Est. $35.3M Opening; 'Me Before You' Opens To $18.3M – Sunday AM B.O. Update". Deadline Hollywood. Retrieved June 5, 2016. ^ "Me Before You (2016)". Rotten Tomatoes. Retrieved September 5, 2016. ^ "'Teenage Mutant Ninja Turtles 2' Struggles With Sequelitis; 'Me Before You' Lures In The Ladies". Deadline Hollywood. ^ "People's Choice Awards Nominees 2017 — Full List". Deadline Hollywood. November 15, 2016. Retrieved November 15, 2016. ^ Johnson, Zach (April 6, 2017). "Guardians of the Galaxy Lands 7 MTV Movie Awards Nominations". E!. Archived from the original on April 6, 2017. Retrieved April 6, 2017. ^ "Me Before You and Disability Article from The Guardian". The Guardian. Retrieved May 31, 2016. ^ a b "Activists protest outside premiere of 'disability snuff movie'". DisabilityNewsService. Retrieved May 31, 2016. ^ "Me Before You makes having a disability seem worse than death". The Independent. Retrieved May 31, 2016. ^ "We long to watch disabled characters like us. Instead we get Me Before You". The Guardian. Retrieved June 2, 2016. ^ "Cherylee Houston Article from The Mirror". TheMirror. Retrieved May 31, 2016. ^ "Why Some Disability Rights Activists Are Protesting 'Me Before You'". Self. Retrieved June 26, 2016. ^ "Me Before You, starring GoT's Emilia Clarke, is a 'disability snuff movie', say protesters". The Sydney Morning Herald. Retrieved June 26, 2016.